The fact that there are currently two official currencies widely used in Cuba may come as a surprise for many. A dual monetary system has inevitably become a significant part of Cuban reality and has exerted a considerable influence on the daily life of its inhabitants. What currencies are used in Cuba? Where can you use each of them? Where can you get them? These are just few questions that this post aims to answer. One of the currencies is called peso cubano (CUP), also referred to as moneda nacional (MN) or peso in short, and the other one peso cubano convertible (CUC) is also known as chavito, dólar, verde, guano or fula, in the vernacular. One of the differences between them is that CUC has a much higher value than CUP. In fact, 1 CUC equals 25 CUP as of the date of publication of this post. This exchange rate is stable as it has been in place for several years already. It is also good to know that the usage of these currencies depends basically on the place. Here we present you a mini guide on how to use and pay in different currencies on the island. Cuban Convertible Peso (CUC) is accepted in most of the hotels, homestays (casas particulares), gas stations as well in some types of transportation (e.g. Viazul Bus or taxi service). In addition, you will be able to pay in CUC in the stores called TRD (Tiendas Recaudadoras de Divisas) and Caracol, among others. Nowadays, as the process of monetary reunification has already been initiated, in most of the establishments you may use interchangeably both currencies, always taking into account the current exchange rate, which is 1 CUC for 24 CUP and 25 CUP for 1 CUC as of December 10th 2015. Nevertheless, there are some private establishments that have their own exchange rates, thus it´s always advisable to ask first. On a curious note, a majority of Cubans receive their salary in Cuban Peso (CUP) although this currency doesn´t have a great purchasing power. For this reason, the salaries can cover only their most basic needs. However, the wages vary greatly depending on the sector. For instance, those who work in tourism-related businesses earn at least part of their salary in Cuban Convertible Peso (CUC), which puts them in a privileged position. On the streets of Cuban cities, you will find lots of products that can be purchased in CUP, among others, delicious, exotic seasonal fruits and a great variety of vegetables, such as bananas (plátanos), cassava (yuca), sweet potatoes (boniato), lettuce, tomatoes, peppers, etc. 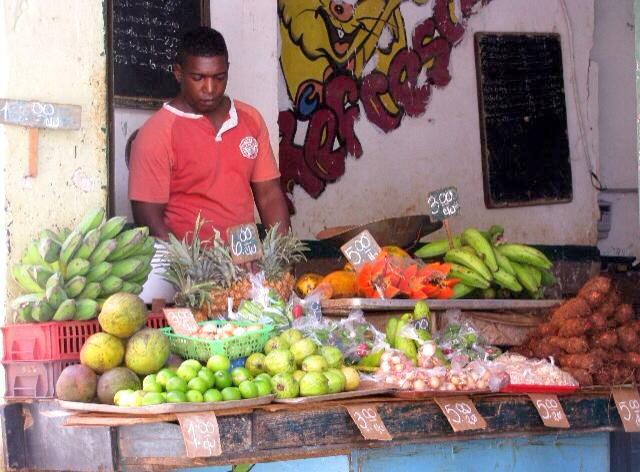 A typical market stand with fresh fruits & veggies in the Old Havana (Habana Vieja). You can also pay in CUP for urban transportation, including buses (widely known in Cuba as guaguas), horse-drawn carriages (carretones) and bike taxis (bicitaxis) which are commonly used in Cuban cities. 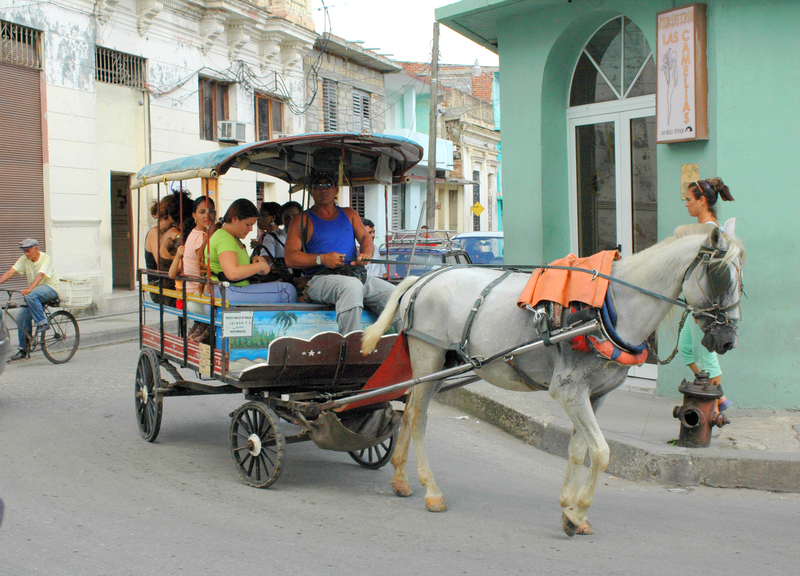 The horse-drawn carriages (carretones or coches de caballo) are one of the most common forms of urban transportation in Cuba. We would like to share with you some useful tips on how to use currencies in Cuba which will help you to enjoy your stay in this marvelous Caribbean island to the fullest. It´s advisable to bring money in cash since many bank cards are not accepted in Cuba or once used, you will be charged a high fee. Bring your money in euro, pound sterling, Canadian dollar or in another currency of internationally recognized exchange value. Preferably, you shouldn’t use American dollars as an exchange currency due to the fact that it is charged around 10%, as of the date of publication of this post and it is stable. You can check current exchange rates in Banco Central de Cuba. You should exchange only the amount of money that you are planning to spend during your stay on the island. In Cuba you cannot use other currencies than the national ones, that is to say Cuban Pesos (CUP) or Cuban Convertible Pesos (CUC). It´s recommendable to exchange money at the official exchange offices. The official government exchange house in Cuba is called CADECA (Casa de Cambio). They have their offices at all the airports, cities and in many hotels. Additionally, you may exchange money in banks. If so, you must bear in mind that they offer a slightly less favourable rate (You’d better check it before the journey). Another option is to exchange money in hotels but in this case you may also be charged a somewhat higher interest, thus you might use this alternative only in case of emergency. It is not advisable to exchange money with citizens who engage in this business informally on the city streets, as this offers no guarantee and can simply be a rip off. Consider exchanging a bigger sum of money in Cuban Convertible Pesos (CUC) and a small amount in Cuban Pesos (CUP), as the latter will certainly come in handy on various occasions. As a matter of fact, numerous services can be paid in Cuban Pesos (CUP) and, as such, are very cheap. It is advisable to exchange the remaining convertible Cuban Pesos (CUC) at the end of your journey since this currency has value only within the island. Although you always lose something in exchange for the preferred currency, you will still recover most of your money. Hope these tips will be of help to you! Give us your feedback & Share this article on social media if you have found it useful. Have a great stay in Cuba!